Here's an eloquent tribute to Wayne Rotstein, by his brother, my friend, Gary. Take a moment and read it. Gary uses his news reporting skills to get to know his brother, after not seeing him for 10 years. His writing brings us a vivid portrayal of Wayne's life which was evolving toward pure simplicity. Wayne is believed to have been swept away into the Pacific Ocean when a dam broke in Kauai 10 days ago. Wayne Rotstein was a kid from Oakland who struggled at school, rebelled at home and never backed down from a fistfight on the streets. 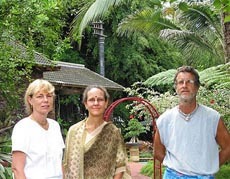 Wayne Rotstein visited the Kauai Hindu Monastery last August with a friend, Sandamini, left, and an unidentified staff member, center. Vishwamitra was a young man searching for spiritual enlightenment while wrestling with the pull of gambling, drinking and pot-smoking. Banyan was a serene, self-taught, self-sufficient Hawaiian who shunned material goods. His plantings made the earth more nourishing and beautiful than those around him imagined possible. My brother went by all three names, in a half-century of evolution, until his freakish death 10 days ago. A dam broke that morning at 6, and he was swept away, apparently to disappear into the Pacific Ocean forever. Six acquaintances lost their lives with him on Kauai, a tropical Hawaiian island nearly 5,000 miles from the asphalt Oakland neighborhood which he and I roamed as youths. Back in our family's cramped apartment across from Forbes Field, Wayne, a year and a half older, was my best friend and worst bully. The distance between us grew ever since. By the time he died at age 49, I hadn't seen him in 10 years. Are You Safer in the Dark? OpentheGovernment.org, a consortium of "Americans for Less Secrecy, More Democracy," whose members include the American Association of Law Libraries, Common Cause, the Society of Professional Journalists, and the Federation of American Scientists, has been active in promoting access to government information that affects the daily lives of Americans. The consortium recently sponsored the second Sunshine Week, a national dialog on open government and secrecy. OpentheGovernment just released a wonderful animated film, Are We Safer in the Dark: An Animated Look Behind the Curtain of Government Secrecy. The film uses real examples of the government's use of secrecy as a basis for withholding information to the public, but the information is conveyed in an accessible, enjoyable format. This film needs to be seen by a wide audience. So if you enjoy the film, send it out into the larger virtual world by forwarding it along to anyone who might be interested. The word needs to get out! When I was in Florida, the question arose whether public libraries have a responsibility to report kids in the library in the daytime who they suspect are truant. I went back to my great source, Sheila Bryant. In addition to being a librarian and former corrections officer, she was also a truancy officer in Florida. Congrats to Sheila, by the way, as she embarks on her job as a cataloger for Florida A and M University, Tallahassee. Essentially, public librarians are not in loco parentis and have no duty to report suspected truancy. Truancy occurs when a student, between the ages of six and 17, miss a certain number of days from school within a specific time period, as defined by the statute of the state that the student resides in. Truancy statutes usually apply to those students that are minors, because in most states the age of an adult is deemed 18; however, there can be exceptions, based on the state statute. Truancy is an issue that affects many people, because truancy has been associated with various criminal behaviors, such as, vandalism, burglary, and drug use. Moreover, there are the complications of illiteracy, failure to obtain a high school diploma, and lack of job opportunities. Also, truancy can be the symptoms for other emotional/mental, economic, and family situations. For instance, the student may comment that due to a divorce or remarriage, that the family dynamics have changed and the student may feel that this adversely affects their relationship with their biological parent. Or a death may have occurred and the student may actually be in a depression, but a single parent who is working may not have eyes to see or ears to hear the student’s cry for help. And in this time negative influences from peers may develop. Usually, the truancy center is working with the school board, law enforcement, and the courts to address truancy and other issues. A typical day involves, a law enforcement officer patrolling his area by vehicle, who notes that student are walking toward the mall, a fast food restaurant, or waiting for public transportation. And remember times vary for elementary, junior high, and high school. Additionally, it makes a difference if the student is in the care of an adult. This is important, because a student may have a medical appointment and parents may rely on public transportation. The officer will question the students, advise their station of the stop, and transport the student to the local truancy agency. The Truancy Case Manager, will contact the school and the parents. The case manager does not usually have the student’s information on file, but will ask the student and will make contact with the school. The case manager will then start an assessment with questions regarding the student’s home life, school life, drug use, and various other circumstances. A determination will be made as to what category the student should be placed into. For example, based on grades and attendance the student could be truant for the first time, just trying it out on a dare with friends. Or the student may have missed three days in the last three months and not meet the criteria of truancy, but has signs and symptoms that may categorize the student to be at risk, needing intervention programs and referrals to counteract truancy behavior on the level of prevention. At the most severe level, the student could meet that statutory definition of truancy, which means that the student needs monitoring by the Truancy Case Manager and based on the statute must appear in court with one or both parents. Just as each truant is different each success or defeat is different. Most parents come to the truancy office meet with the truancy case manager and are able to take their child home with no problem, but some cases result in the parents being jailed for not insuring that their child attend schools. Please note that it is solely the parent’s responsibility to comply with the compulsory education of their children and no one else. To ensure that you have the best knowledge regarding truancy please read your state’s statute or contact your local truancy office. For more information on truancy please consult the links below. The Palo Alto hearings will be held in the Moot Court Room (Room 80) of the Stanford Law School, Crown Quadrangle, Palo Alto, CA Thursday, March 23, 2006, and Friday, March 24, 2006 - 9:30 a.m. If you're interested in libraries and copyright, you'll want to read Peter's forthcoming article: Peter Hirtle, Research, Libraries and Fair Use: The Gentleman's Agreement of 1935. The Gentleman's Agreement was a landmark fair use agreement -- consensual voluntary guidelines that allowed libraries, archives and museums to make copies back in the days when microfilm threatened the status quo of hand copying. What surprised me the most is the pivotal role of librarians in shaping the agreement. The article paints a colorful picture of the negotiators, especially of 33 year old Robert C. Binkley, WWI vet, reference librarian, and micofilm enthusiast. We also meet Harry M. Lydenberg, from the New York Public Library... their presence gives library interests greater weight than general educational interests. Peter delved into archives at the Library of Congress, Princeton University, the Univ. of IL and the Univ. of VA to get deep background. I plan to assign this article to my library students this summer at San Jose State in my course on copyright. Understanding the line between public domain and copyright is difficult to discern, as described in a post about the This Land is Your Land JibJab controversy. For example, people can't even agree on whether all, part, or none of "Happy Birthday" is protected by copyright or in the public domain. In an upcoming New York University Law Review article, Brooklyn Law School Professor Jason Mazzone calls the claiming of copyright in public domain materials "copyfraud." The simple answer is -- NO! Wasn't Peter Rabbit first published in the United States so long ago that it is in the public domain? Surveillance tapes catching someone in the act in a library ? A TV show contacted me to ask for stories and especially surveillance tapes of library patrons caught in the act. If anyone has some, please let me know. Susan Nevelow Mart writes: The library and bookstore community didn't get the protections it wanted in the Patriot Act reauthorization. It didn't get language to require that the person whose records were being requested was strongly suspected of terrorism. However, the fight goes on. Senator Arlen Specter (R-PA) introduced a bill in Congress on Monday to amend the Patriot Act to protect civil liberties. The bill has eleven co-sponsors, and the text of the bill, S. 2369, is available online. "relevant to an authorized investigation (other than a threat assessment) conducted in accordance with subsection (a)(2) to obtain foreign intelligence information not concerning a United States person or to protect against international terrorism or clandestine intelligence activities; and either pertain to a foreign power or an agent of a foreign power; are relevant to the activities of a suspected agent of a foreign power who is the subject of such authorized investigation; or pertain to an individual in contact with, or known to, a suspected agent of a foreign power. Currently, the standard is only that the documents and things requested have some “relevance” to a terrorist investigation, which is very broad. The new language would require that the records relate to a person with some demonstrable connection to a terrorist or terrorist group. The co-sponsors are Larry Craig (ID), Richard Durbin (IL), Russell Feingold (WI), Dianne Feinstein (CA), Chuck Hagel (NE), John Kerry (MA), Patrick Leahy (VT), Lisa Murowski (AK), Barack Obama (IL), Ken Salazar (CO), and John Sununu (NH). I'm sending my senator a letter of support. Those of you who are not going to be at the Copyright Office's Roundtable on Section 108 tomorrow, March 8th, may want to watch instead the House Judiciary Committee's hearing at 2 PM on the recent report on orphan works from the Copyright Office. It will be streamed live from the Committee's web site. Jule Sigall from the Copyright Office, Allan Adler from the Association of American Publishers (AAP), David Trust from Professional Photographers of America, and Maria A. Pallante-Hyun from the Guggenheim Museum are scheduled to testify. It will be very interesting to see what changes they will offer to the statutory proposal included in the Copyright Office's report.